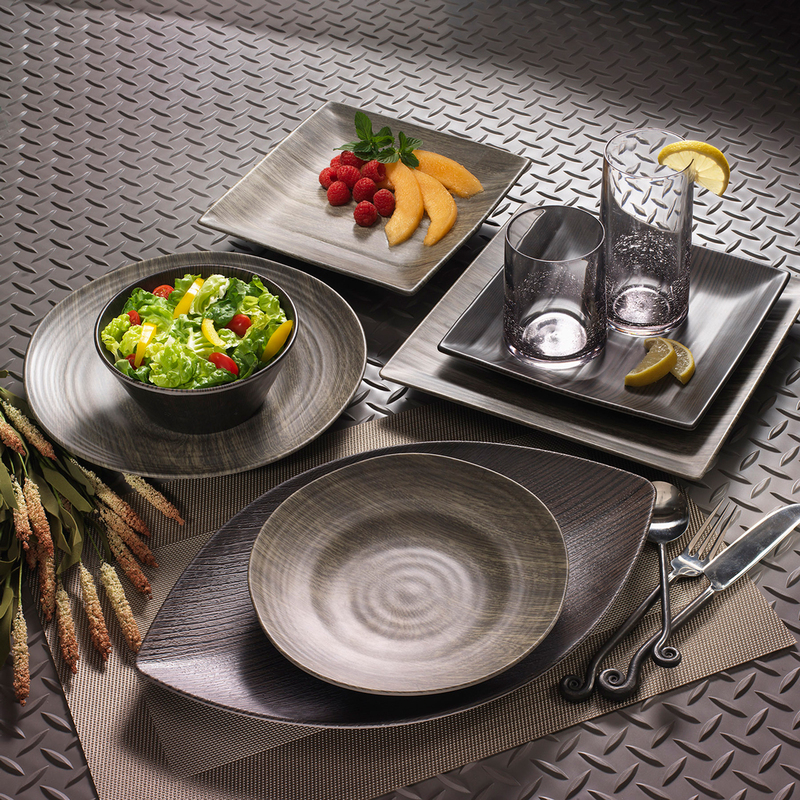 Melamine — virtually unbreakable tableware — has become a major force in the tabletop category. Why? 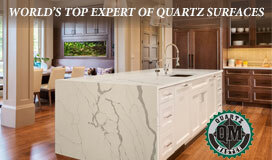 The growth of casual dining, al fresco living and a “shift toward a more relaxed take on entertaining,” says Desiree Gamotin, marketing and communications manager for Q Squared, a pioneer of luxury melamine. This ongoing lifestyle shift has inspired brands such as Q Squared, Jonathan Adler, Kate Spade and Merritt to offer practical alternatives to fine china and ceramic without sacrificing aesthetics. 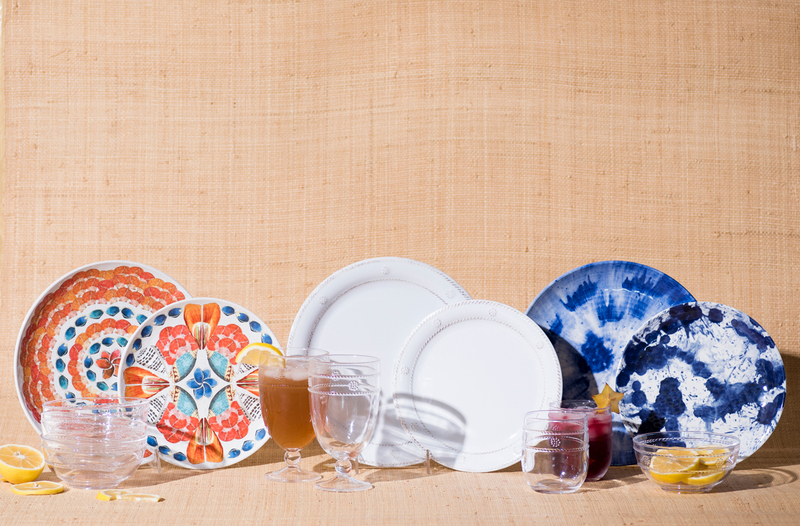 Other venerable names in the tabletop industry — Royal Doulton, Juliska , Portmeirion and others — have joined the melamine market, introducing break-resistant versions that closely resemble some of their best selling ceramic or porcelain counterparts. Make no mistake. This is not your mother’s melamine. Advances in technology have led to highly durable, fashion-forward designs intended for any season or occasion, indoors or out. 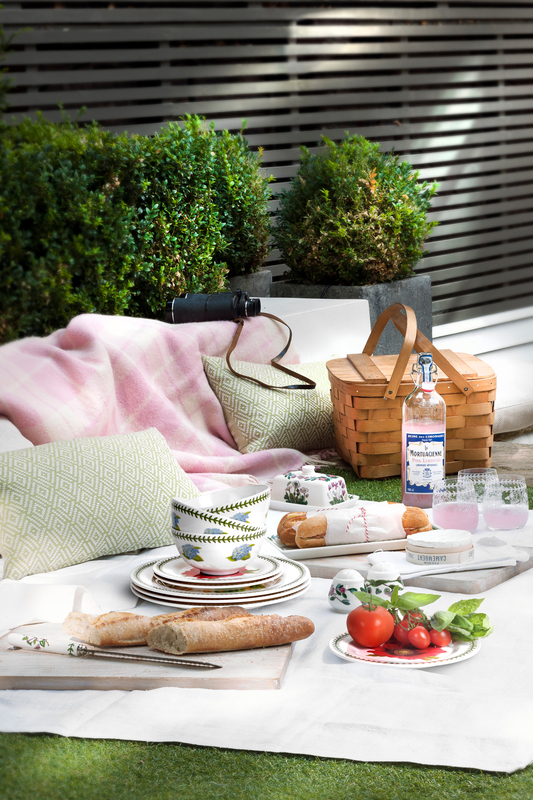 Botanic Garden — one of Portmeirion’s best-selling patterns — is now available in melamine, bringing high style to outdoor living. 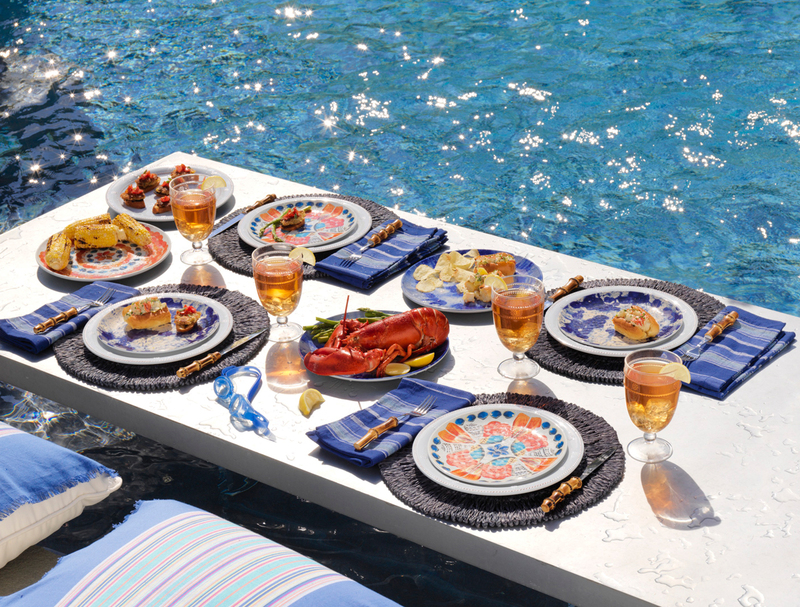 Durability meets design in Juliska’s Al Fresco Collection, shown with acrylic drinkware, Straw Loop Delft Blue Placemat and Natural Bamboo utensils. From left: Oceana, Berry & Thread and Splatter & Spin dinnerware; Isabella Acrylic Collection, Berry Bowl, Goblet and Tumbler. From Juliska. 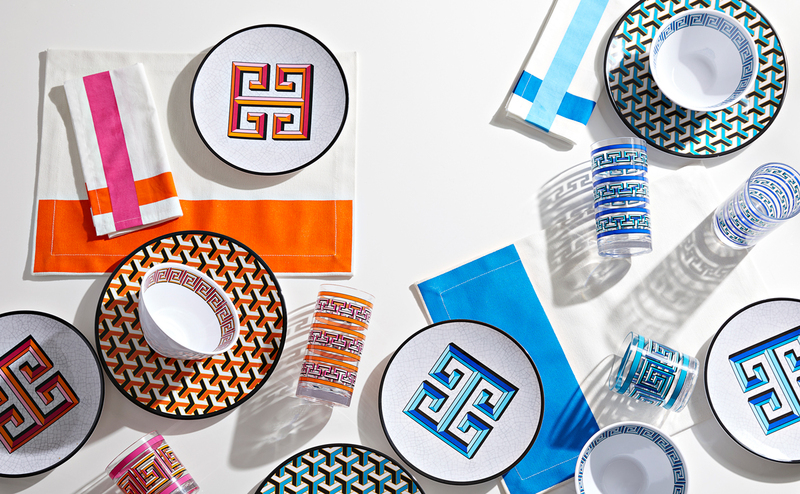 Besides being effortlessly chic in graphic geometric motifs and Greek key patterns, Jonathan Adler’s Mykenos Melamine dinnerware and acrylic glassware is indestructible and BPA-free. 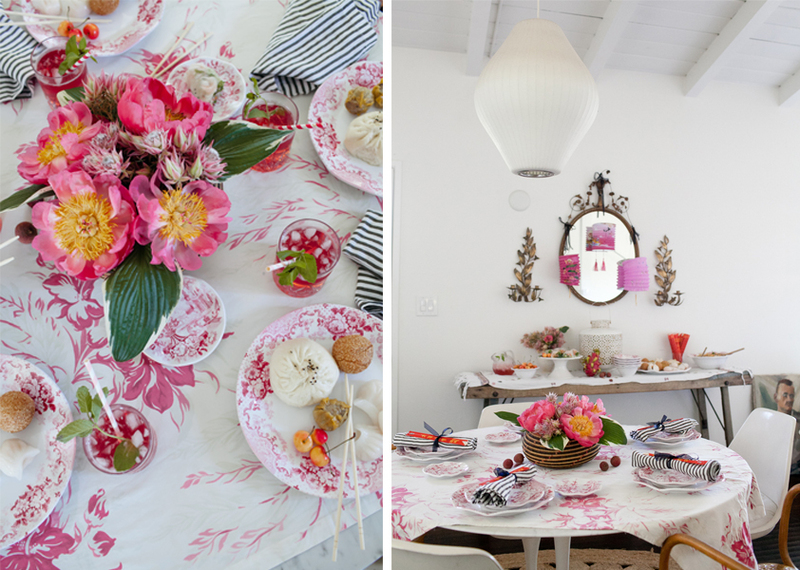 A Chinoiserie-inspired dim sung party created with Q Squared’s Cambridge Rose Collection in Crimson. 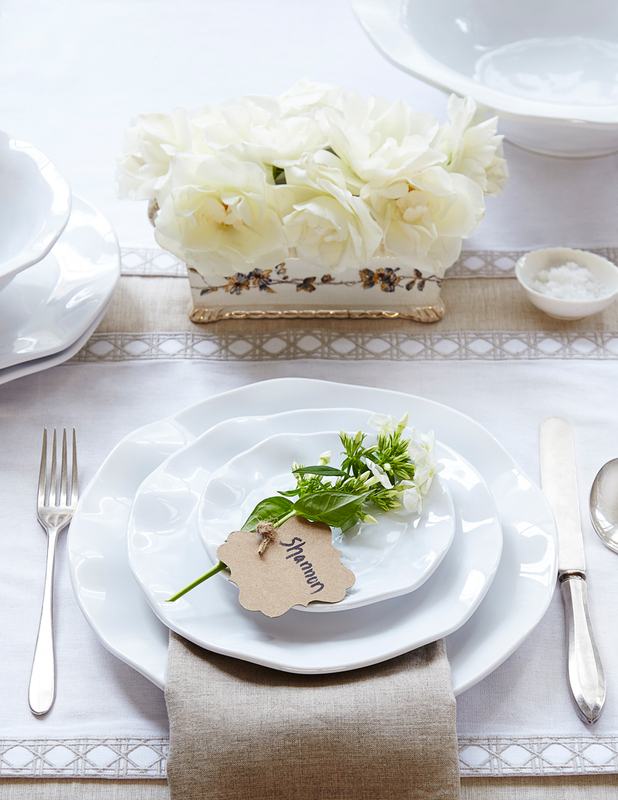 White dinnerware is the perfect base for any occasion. Hand-polished for a smooth high-gloss finish, the Ruffle Collection — in high-grade melamine —looks and feels like porcelain and ceramic. Walnutwood’s warm wood coloration (from Merritt) and textured grain design fools diners into believing the melamine is actual wood. 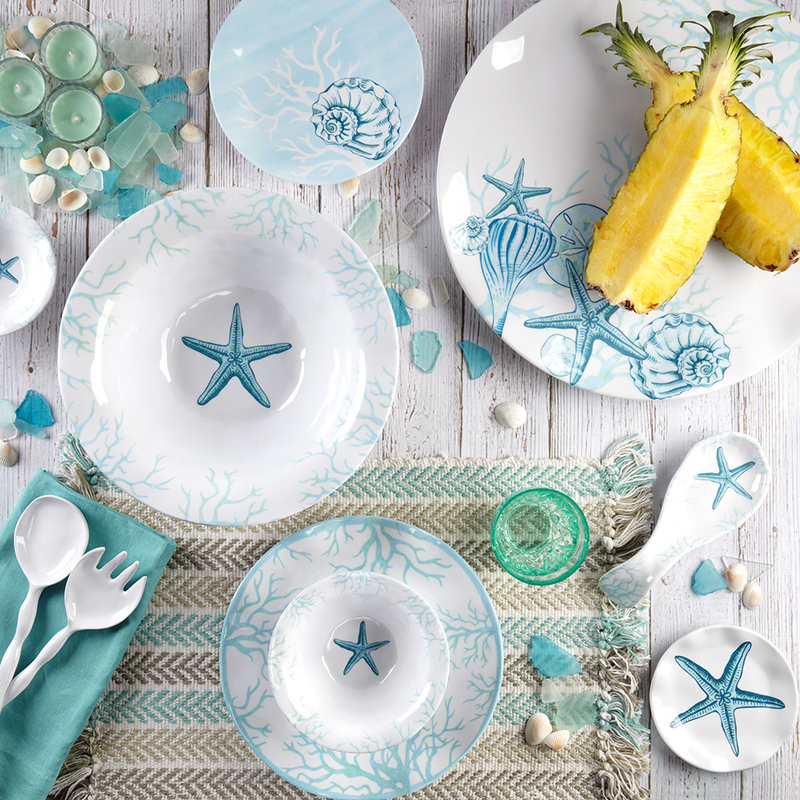 Impressionistic shells and sea life — in shades of turquoise and coral — are splashed across this heavy-duty white melamine with a rope-look border from Merritt. 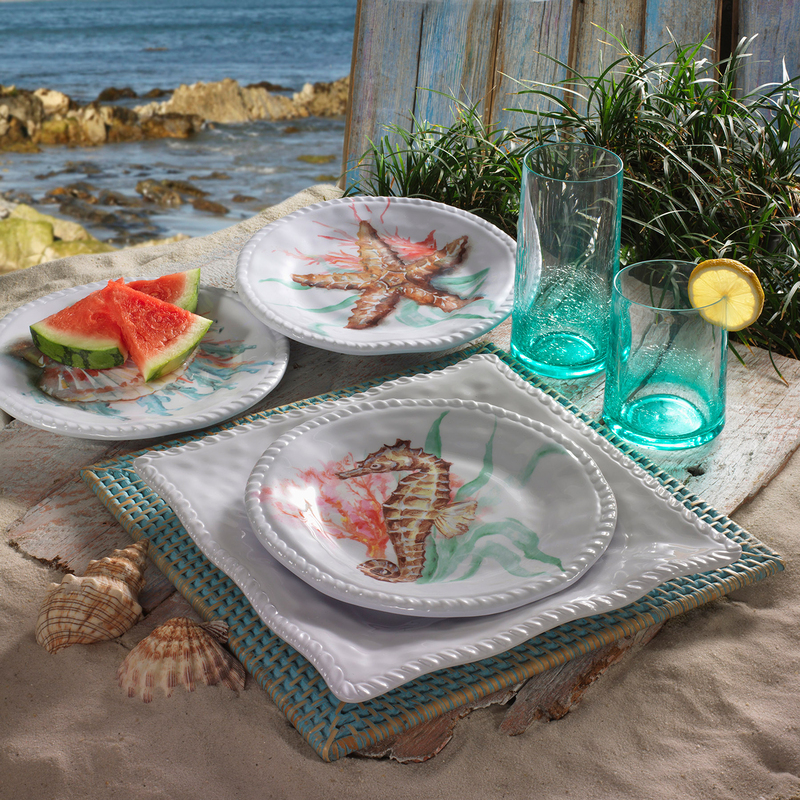 Teaming with tranquil sea life, Captiva from Q Squared transports the serenity of the beach to the patio. For a look at how it inspired an indoor setting in Rumson, see “Coastal Connection” in the June/July issue of Design NJ. 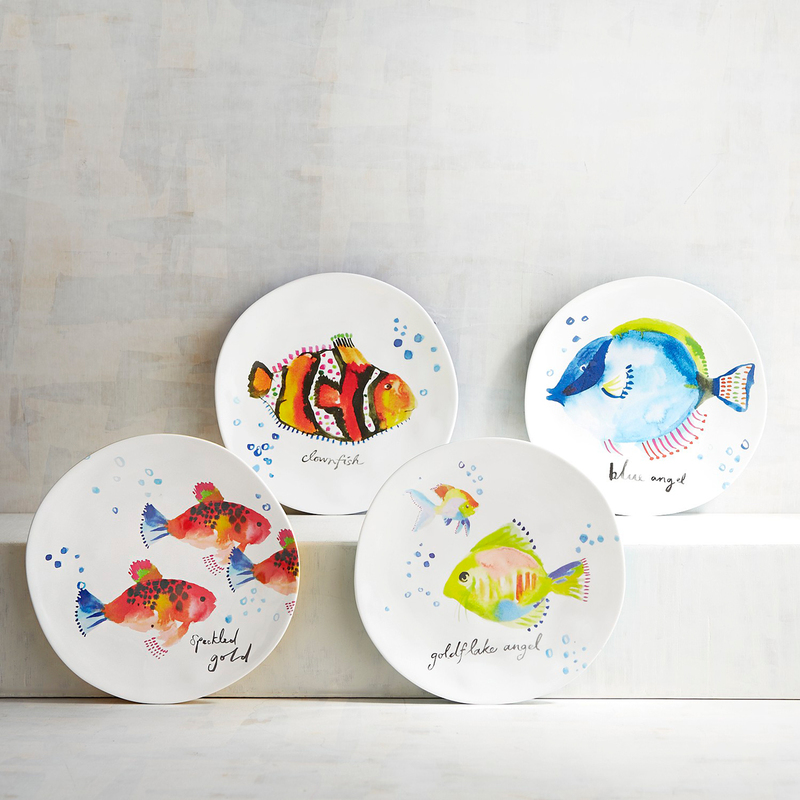 Whatever you’re serving, whimsical sea creatures fit the casual occasion and eliminate the angst of broken dinnerware. 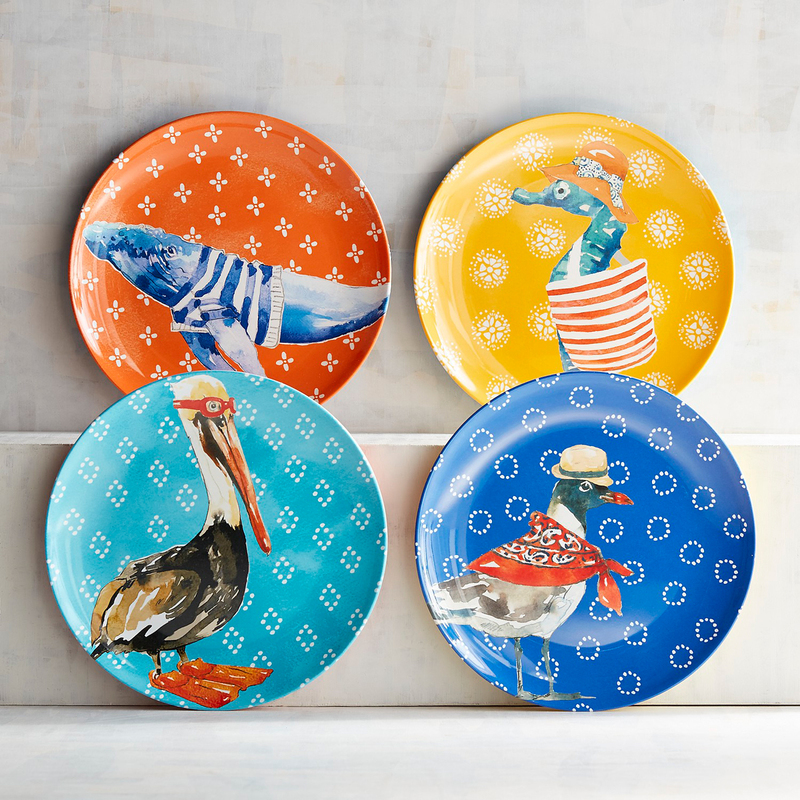 Beach Fun Melamine Salad Plates from Pier 1. 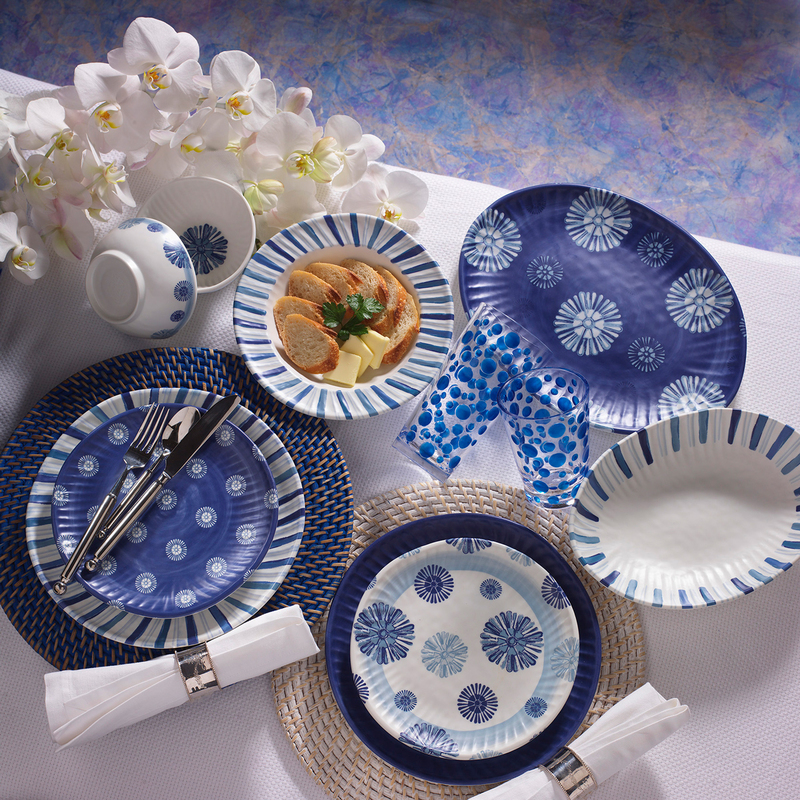 Pacific, one of Royal Doulton’s best-selling patterns, is reinterpreted in melamine. Patterns in deep blue decoration on white capture the natural tides of the coastline and the spray of the ocean. Merritt’s Watercolor Blues collection depicts a melody of blues in stripes, dots and bursts with contrasting crisp white. 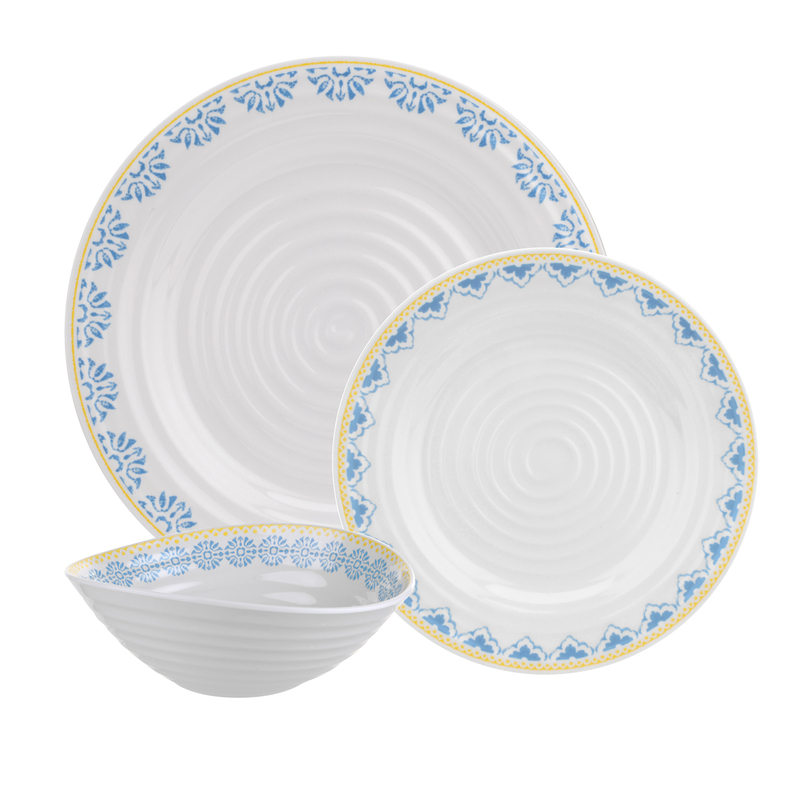 The Sophie Conran collection from Portmeirion is decorated with a stamped blue and yellow design in the same organic shapes as the porcelain counterpart. 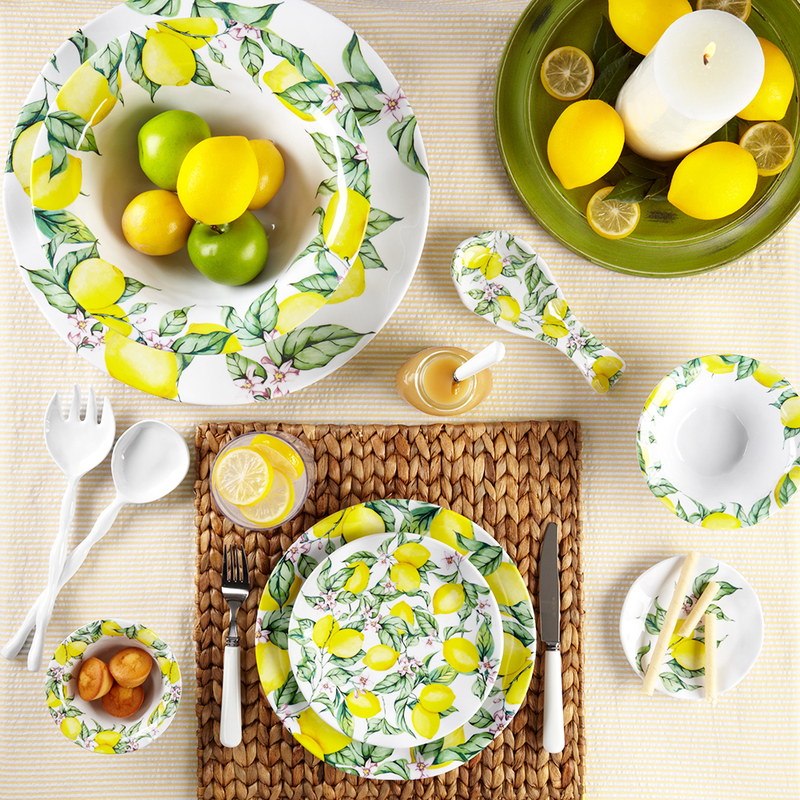 Host a cheerful Sunday brunch with fresh cascades of lemons and romantic blooms. Limonata Collection from Q Squared. 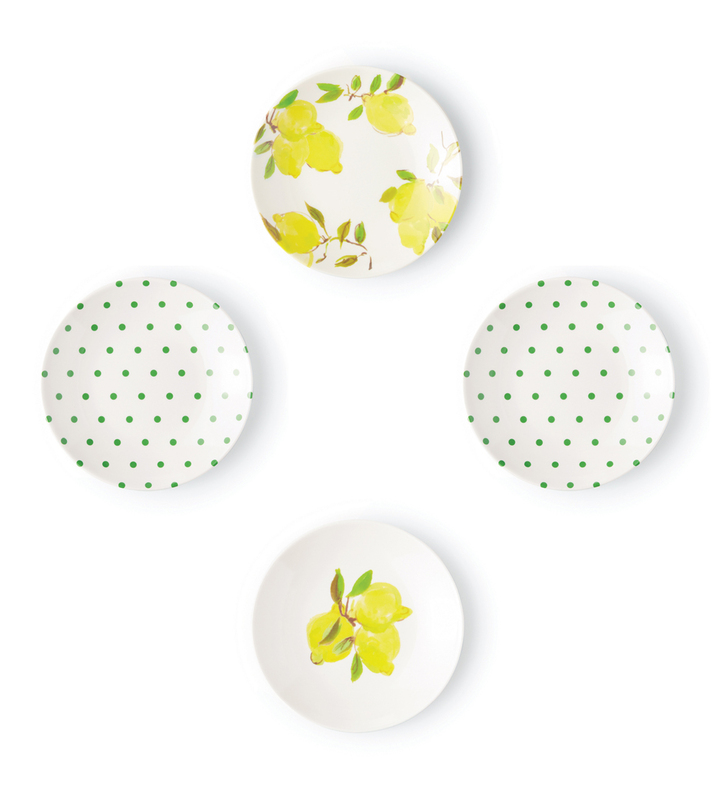 Even carryout will feel extra-special with Kate Spade’s citrus-themed Lemon Melamine Collection.